Chagas' (SHAH-gas) disease is a parasitic infection common in South and Central America. It is chronic (long-lasting) and can seriously damage the heart and the digestive system many years after a person gets infected. Another name for it is American trypanosomiasis (tripan-o-so-MY-a-sis). Chagas' disease is an infection with a protozoan (pro-to-ZO-an), a tiny parasite called Trypanosoma cruzi. This parasite infects many kinds of mammals in South and Central America. It is spread to people by blood-sucking insects called reduviid (re-DOO-vi-id) bugs. These bugs, also called kissing or assassin bugs, pick up the parasite when they bite an infected person or animal. The parasites multiply inside the bugs. When the bugs bite other people, they deposit parasite-laden feces on the skin. If the people accidentally rub the feces into a cut or scratch, or into their eyes or mouth, they can get infected too. Reduviid bugs, like the assassin bug shown here, live in the cracks and crevices of poorly built houses. Reduviid bugs can pick up the Trypanosoma cruzi parasite that causes Chagas' disease when they bite an infected person or animal and then pass along the parasite to the next person they bite. Reduviid bugs tend to live in the cracks and crevices of poorly built houses in rural South and Central America and in Mexico. So Chagas' disease used to be largely an illness of the rural poor in those areas. But in the 1970s and 1980s, many people moved from the countryside to Latin American cities, bringing the infection with them. In the cities, it started to spread through transfusions of contaminated blood. More rarely, it can also spread from a pregnant woman to her fetus. Chagas' disease is estimated to kill up to 50,000 people a year. What Are the Symptoms of Chagas' Disease? Chagas' disease has acute, indeterminate, and chronic phases. People usually get infected as children. Most have no symptoms, but some have fever, swelling of the lymph nodes, or swelling around the eyes, if that was where the parasite entered the body. Symptoms usually go away in four to eight weeks. In rare cases, there may be heart damage or seizures. In people with weakened immune systems, such as those with AIDS, the acute stage can recur later, in a very severe form. The parasite is still present in the body but causes no symptoms. This stage lasts a lifetime in most infected people. enlargement of the esophagus (the tube carrying food from the throat to the stomach), which can make eating difficult. How Is Chagas' Disease Diagnosed and Treated? In the acute stage, the parasites can be seen when blood is examined under a microscope. In the later stages, diagnosis is more difficult, and an array of different blood tests is used. In the acute stage, the parasites often can be eliminated by prescription medication taken for several months. In later stages, there is no proven cure. Instead, doctors try to treat the symptoms of the organ damage the parasites cause. How Is Chagas' Disease Prevented? In Latin America, many countries are taking part in a campaign to wipe out Chagas' disease. They are using pesticides to kill the bugs that transmit the disease, and they are upgrading housing so the bugs cannot hide in cracked walls and thatched roofs. They also are trying to screen blood supplies more thoroughly. This campaign is farthest along in the countries of the "Southern Cone": Argentina, Brazil, Chile, Paraguay, and Uruguay. In this area, new infections of children and young adults reportedly were reduced by almost 70 percent in the late 1990s. Travelers to areas where Chagas' disease is common should use insect repellent (bug spray). If possible, they should avoid sleeping in thatch, mud, or adobe homes, or they should use bed nets at night. Chagas' disease occurs only in the Americas, mainly in South and Central America and in Mexico. It is believed to create a greater economic burden than any other tropical disease except malaria and schistosomiasis. In South and Central America, about 16 million to 18 million people are infected with Chagas' disease. Many live in thatch, mud, or adobe houses in poor areas. 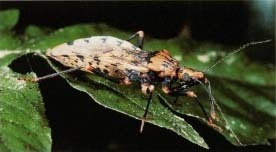 In the United States, many people who emigrated from South and Central America are thought to be infected with Chagas' disease, chiefly in the indeterminate or chronic stages. But it is extremely rare for someone to catch the disease in the United States. In a recent 20-year period, fewer than 20 newly acquired U.S. cases were reported, including three from blood transfusions. About 50,000 people die each year from the disease. The World Health Organization (WHO) reports that about 100 million people are at risk of developing Chagas' disease. The World Health Organization posts information about Chagas' disease at its website. The U.S. Centers for Disease Control and Prevention (CDC) has a Division of Parasitic Diseases that posts information about Chagas' disease at its website.